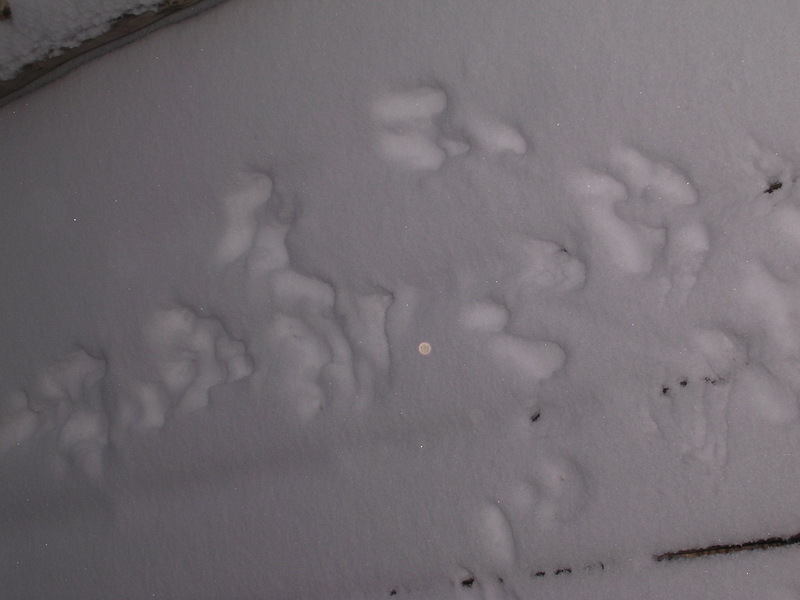 I went out yesterday to shovel yet again another foot and a half of snow and found Bizzy tracks all over the porch. Yes, despite the huge amount of snow he still makes it through! Two days ago I finally saw Bizzy for the first time!!! He seems to sneak in at night. It was so wonderful to see him hopping along en route to his smörgåsbord for dinner. Apples, carrots, broccoli, rabbit chow, cat chow and raisins….Happy camper! I cannot express what an amazing feeling it is to make friends with a wild animal who feels safe enough to venture out onto your porch every night. Great fun! So jealous! Of the bunnies and the snow!!! We need snow! Happy for you about the bunnies, really, and for the snow if you want it. But if you don’t, please send it our way! How wonderful to have such a sweet wild companion!